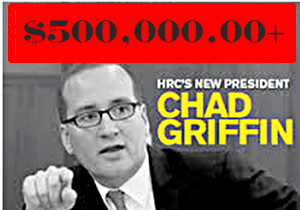 HRC Prez Chad Giffin's 2013 Salary $507,000.00, Stealing Credit and Rewriting History Sure Pays Well! Home/Featured/HRC Prez Chad Giffin’s 2013 Salary $507,000.00, Stealing Credit and Rewriting History Sure Pays Well! Which brings the total of just salary alone for just these 8 people including Griffin to $2,347,473.00 of the LGBT community’s hard earned donation money. In 2013 HRC received an estimated $56,000,000.00 in donations. The incumbent District 8 member of the San Francisco Board of Supervisors, Scott Wiener, used to be on the board of directors of HRC. Just one of many reasons why he’s got no activist support. With all this funding, I find it interesting, when I emailed them about doing some type of supportive protest on the first day of Marriage here in NY, I was told they didn’t have funding for that, and if I wanted to see it done I should do it myself. Wow, no funding for LGBT projects but funding for big payroll. What’s wrong with tho picture! Just went to Charity Navigator. The Human Rights Campaign Foundation gets a four star rating. Here’s a link to the site http://www.charitynavigator.org/index.cfm?bay=search.summary&orgid=6229#.VAX2abl0w5s. 77% of funds go to program expenses 12% to fund raising and 10% to administration. Are HRC and the HRC Foundation separate entities? Oh shut up. “Following” does not = “membership” – he’s not leading a membership organization like AARP, which offers tangible benefits to its members (in addition to its advocacy efforts). God, we like to eat our own. There was no confusion. I just added up the numbers from both the HRC PAC and the HRC Foundation (501c3) 990’s. The total 2013 compensation for Chad Griffin is $507,907. Just the facts. Sorry, just read your full post explaining the somewhat convoluted 990’s. Running a both a PAC and a 501c3 can be a tricky business when it comes to transparency.